Bead Up -- the journey of handmade jewelry: Do It Yourself: Jewelry Displays That Make Oriental Trading Company Look Expensive! 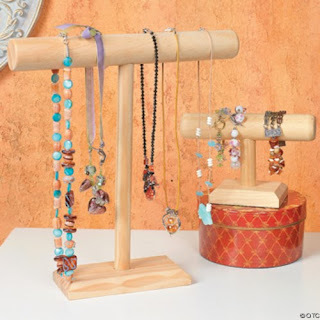 Do It Yourself: Jewelry Displays That Make Oriental Trading Company Look Expensive! With my first jewelry party less than 2 weeks ago, I have been thinking long and hard as to how to best display and organize my jewelry for the event. A few weeks ago I was browsing through Oriental Trading Company's website and came across this little number: After factoring in shipping and handling, it would have cost me $25 for these two little guys (that's $12.50 a piece)! Knowing we could do much better, the Hubs and I headed to Home Depot and Lowe's for some dowels and base material. We bought one 1" wide by 3 feet long dowel and another one that was 2" wide, in addition to a husky piece of thick plywood. The Hubs started by measuring the dowels to ensure we get 3 full pieces out of each (with the horizontal top piece totaling to 14"). Next he drilled a hole into each as a way to insert the perpendicular dowel to hold the larger piece horizontally (like our makeshift saw horse?). With his new laser saw toy of a thing, he cut the base into 5"x5" pieces. With a little glue and patience, we had ourselves three new jewelry displays! Boo Ya! Add a little bit of what I have been working on for my Jewelry Party and you have yourself a jewelry display! You said buying these stands would cost $25. Later, you said you saved $27.50 by doing it on your own. Is it just me or is that impossible? hahaha. Either way, nice job on the DIY stands. They look great! I like this alot. if my hubs were handy at all. i would totally do this. although i am still crushing on the tree thing! Great job. They look soo professional. I love the unstained wood too. I am just now seeing this and I love it! I would paint it and maybe even add felt so that they slide on smooth and do not damage your pieces at all! Thanks for the tutorial! I am totally going to buy the stuff to make these this weekend to use with jewelry collection. I have been trying to figure out how to store my jewelry so that I can see what I have and find it fast. Love these. Thank you so much for sharing.